If you’ve read the series of novels by James S.A. Corey, then the most surprising thing about The Expanse is that it manages to translate the dense, interwoven stories of the books into a near-perfect TV show. If you haven’t read the books, the most surprising thing is that anything this good exists at all. In the future of The Expanse—two hundred years from the present—a whole new interplanetary system has taken hold. Earth is run by the United Nations, and rich as only a homeworld can be. Mars has been colonized and built itself up as the largest military power. And the asteroid belt is mined for resources that are sold back to Earth and Mars, with the Belt’s stations and outposts in desperate need of air and water. None of these three groups like each other, and the people who live in the Belt (Belters) are most definitely of a lower class than those from Mars or Earth. While there’s a bit of text at the beginning, most of this is actually conveyed by the characters. We see the mess and squalor of Ceres in the Belt. Compared to when we spend time on Earth with Chrisjen Avasarala (Shohreh Aghdashloo), which is rich and lush. It’s no coincidence that our first look at Earth is the outdoors, which we won’t see in the Belt. Belters are also consistently taller than the others, the result of growing up in low-gravity. At a minimum, there are three different stories—and styles of story—woven into the pilot of The Expanse. On Ceres Station, there’s Detective Miller (Thomas Jane) doing his level best to survive in a neo-noir. Miller’s got the alcoholism, divorce, and minor police brutality that are prerequisites for this kind of character. He’s even got the hat. He’s been given the task of tracking down Julie Mao (Florence Faivre). We know from the opening scene that something bad has happened to her, since she’s alone, in zero g, on a ship filled with bodies. But to Miller, she’s the mystery that he actually cares about. On Earth, there’s a political thriller going on, with Avasarala visiting a Black Site, where a Belter is being tortured for information. We see her playing with her grandson and talking about how important it is to tell the truth and engaging in some casual racism about how the gravity of a “real planet” is hurting the “weak Belter lungs.” She wants to know what the “terrorist” was doing with banned technology. Aghdashloo is utterly terrifying, by the way, and the most mysterious. The rest of the episode is hewing pretty close to the first book, Leviathan Wakes, but Avasarala isn’t in that book. It’s a good call on the part of the writers to bring this plot up, since it brings Earth in earlier. And out in space is the Canterbury, which is a more traditional space opera set-up. We first meet the Cant it’s through Jim Holden (Steven Strait), the singularly unambitious officer on the ice hauler, who’s mostly into banging the ship’s navigator. The Cant receives a distress call, and if anything sums up the way this show is different from a shiny, happy future, it’s the way the ship reacts: the captain orders them to ignore it and deliver their cargo on time instead. And we also get a glimpse into Holden’s depths when he hears a voice saying “please help me” on the call and can’t stick to his conviction to back the captain’s call. 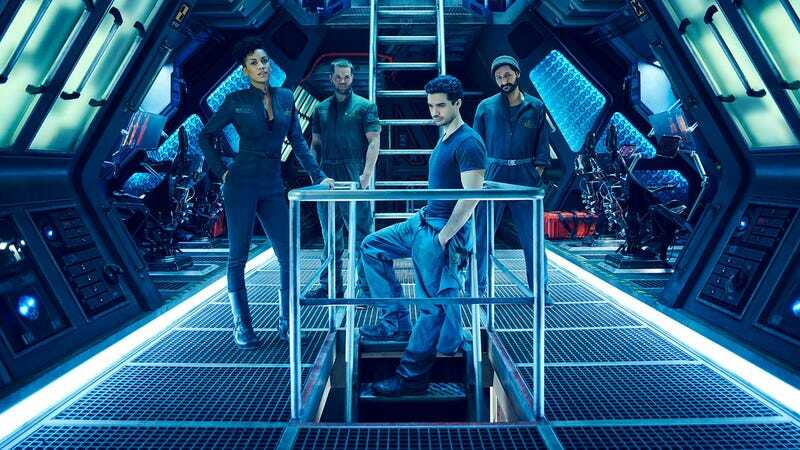 Holden ends up on the rescue mission with engineer Naomi Nagata (Dominique Tipper), mechanic Amos Burton (Wes Chatham), pilot Alex Kamal (Cas Anvar), and medic Shed Garvey (Paulo Costanzo). Which is a good thing, since not being on Canterbury saved their lives. For book readers, the destruction of the Cant isn’t exactly a surprise. For this show, and for Syfy, it’s a huge sign of faith. They built an exquisite set for it and it only appears in the first episode. It’s that attention to detail and commitment to the story that makes The Expanse such a rewarding watch. So is the way that every character has complex personalities. Miller is mostly a sad sack, but he’s committed to figuring out where Julie Mao is. Holden doesn’t care about advancement, but he can’t ignore the distress call. Miller takes bribes, but also intimidates someone who provides substandard air. And so on and so forth. This means that, because these are real people with complicated issues, we’re not going to be seeing everyone make the morally correct solutions every time. Even though the three different characters don’t meet, politics connects them all. Throughout the episode, the tensions between Earth, Mars, and the Belt simmer. There are radicals preaching Belter freedom on Ceres, and Miller’s been sent to find Julie because her parents are rich Earthers. Avasarala is chasing down a Belter plot to target Earth. And it seems like the only group with the technology to take out the Cant is Mars. It’s been far too long since Syfy got this much right in a television show. Lauren Davis was right when she said that the last one was Battlestar Galactica. That’s likely to be a common comparison, since both shows have epic scopes and futuristic technology that looks lived in. In just one episode, The Expanse does a lot of heavy lifting without you noticing. There are a lot of character introductions, a whole political landscape, and a major set piece all in 45 minutes. Even knowing roughly where things are going doesn’t make it less compelling. You are going to want to watch the whole season.